One very important quality entrepreneur should have is creativity and innovation. Whenever I come across creativity it reminds me great entrepreneur Steve Jobs of Apple. Steve Jobs gave many creative ideas to world (like touch screen device). Steve Jobs was creator and innovator. Another creative entrepreneur is Jan Koum who has given great app to world called as whatsapp. 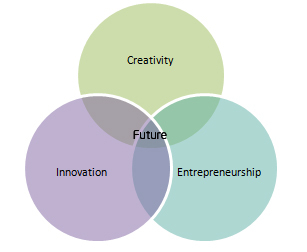 So what is creativity and innovation and how it is related to entrepreneurship? Creativity is thinking new things, and innovation is doing new things. Creativity is the ability to develop new ideas and to discover new ways of looking at problems and opportunities. Innovation is the ability to apply creative solutions to those problems and opportunities in order to enhance people’s lives or to enrich society. Entrepreneurship is the result of a disciplined, systematic process of applying creativity and innovation to needs and opportunities in the marketplace. Entrepreneurship is the process of making something original and valuable. This will be done by investing time, effort and money. At the same time entrepreneur must accept risk so that he can gain a reward for this risk. Entrepreneur must perceive this as new business opportunities and develops idea on how to implement them. This perceived business opportunity can give the desired results only if entrepreneur strongly believes in it. In order to turn perceived business idea into a successful business enterprise, entrepreneur has to be creative and innovative and ready to make sacrifices and accept the risks and uncertainty that the job demands. Creativity can be defined as the ability to notice problems and develop methods to overcome. Innovation is defined as bringing new product/service/process in general use. Innovation and creativity plays major role for entrepreneur. The entrepreneur who continuously creates new ideas and innovates will be able to meet the changes and needs of modern society.